Many people going through midlife develop fatigue, low libido, or depression. This includes men and women alike. Experience has shown that if the estrogen level in females or testosterone level in males or females is low, a trial replacement of these hormones can bring about dramatic improvement and is therefore worth considering. An underactive adrenal gland can aggravate testosterone deficiency. Although the ovaries make most of a woman's estrogen and the testicles make most of a man's testosterone, the adrenals make significant amounts of both. Unfortunately, the large amount of media coverage given to problems caused by Premarin has resulted in many people stopping all hormonal support. As most of you are aware, Premarin contains a form of the hormone that comes from pregnant horse urine. Most complementary physicians have not used Premarin for over a decade. Fortunately, natural options other than Premarin are available. Although not likely to be a problem with men, deficiencies of estrogen and/or progesterone can be major problems in women with CFIDS/FMS. In a wonderful book by Dr. Elizabeth Lee Vliet, Screaming To Be Heard: Hormonal Connections Women Suspect ... and Doctors Ignore (M. Evans and Company, 2000), the role of estrogen deficiency in causing fatigue, brain fog, disordered sleep, fibromyalgia, poor libido, PMS, low levels of serotonin and other neurotransmitters, interstitial cystitis, as well as other problems is reviewed in detail. She notes, appropriately, that the perimenopausal period has a gradual onset, and symptoms of estrogen deficiency can occur 5-12 years before the patients' blood tests and periods become abnormal. As noted previously, hypothalamic dysfunction can cause estrogen deficiency as well. * Are your CFS/fibromyalgia symptoms worse the week before your period? * Do you have decreased vaginal lubrication? It can be helpful to have the patient keep a symptom log relative to their periods. Part of the difficulty in checking estradiol (the most active form of estrogen) and progesterone levels is that the normal range fluctuates widely during the patients' cycle. Dr. Vliet feels that at menopause, estradiol levels should be kept over 100 picograms per milliliter (pg/mL) of blood, and that symptoms are likely if levels are under 50 pg/ml (normal peak levels are over 200 pg/ml at ovulation). If levels of follicle-stimulating hormone (FSH) or luteinizing hormone (LH), two other hormones involved in regulating the menstrual cycle, are high or low normal and/or the patients' symptoms cycle with their periods, a trial of estrogen is helpful. In my experience, and that of Dr. Vliet, many of the symptoms noted above can improve dramatically with estrogen replacement. 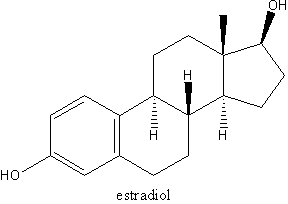 Dr. Vliet notes that 17-beta-estradiol is the major active form of estrogen naturally found in the human female. For menopausal women, this can be found in Estrace tablets or Climara or Estraderm patches. Many physicians prefer natural biestrogen from a compounding pharmacy. This contains estradiol plus estriol, a weaker form of estrogen that is much higher when the patient is pregnant. I prefer using this form as excellent work by Dr. Jonathan Wright, as well as a number of other studies, suggests that higher levels of estriol are actually protective against breast cancer. For example, the younger a woman is when she first gets pregnant and the more time she spends being pregnant, the lower her risk of breast cancer. Unless a woman has had a hysterectomy, if they take supplemental estrogen, they must also take progesterone to prevent uterine cancer. I prefer natural progesterone--for example, 200 milligrams of Prometrium a day for the first ten days of each month, or 100 milligrams every day. Taking both estrogen and progesterone every day will often result in the patients' periods ceasing after six to nine months, and most women over 48 or so prefer this approach. Many compounding pharmacists are happy to help you and the patient adjust treatment based on the patient's symptoms to determine the optimum dosing and timing--at no charge. Below are the treatment recommendations from the treatment checklist that I give patients. For those of you who are adequately trained in using these hormones, but are not yet allowed to prescribe in some states, I have also noted how one can get similar hormones for patients without a prescription. Low Testosterone--Not Only a Male Problem! Low testosterone is a major problem in 70% of my male patients with CFIDS/FMS. After six to eight weeks, the effect of treatment is sometimes marked. It is important (again, in both men and women) to check the free, or unbound, blood testosterone level. This measures the active form of the hormone. A serum (or total) testosterone level measures only the inactive storage form of the hormone. Inactive (total) testosterone levels are often normal while the active (free) testosterone levels are low or barely normal in most male CFIDS/FMS patients. Low testosterone is associated with many problems, including fatigue, poor stamina, muscle wasting, and poor libido. Although testosterone levels are normally much lower in females, deficiencies in women cause these same problems. Testosterone is critical in females, as well as males, and I find low free testosterone levels in many female CFIDS/FMS patients as well. Again, it is important to check the free (not just total) testosterone. Most laboratories can test free testosterone only if they also do the total testosterone--this is a normal procedure. Be sure that the normal ranges for the lab results are broken down by ten-year age groups (31 to 40 years old, 41 to 50 years old, and so on). It is meaningless to have a normal range that includes 80 year-olds if the patient is 28. If the result is below normal, or even in the lowest 25% of the normal range, I would consider a trial of testosterone therapy. For men, the standard dose is about 100 to 125 milligrams intramuscularly (by injection) every seven to ten days. It can also be given as 200 milligrams every two weeks, but this can result in peak levels right after the shot that are too high, and levels that go too low for a few days before the next shot. Adding testosterone patches on day nine to fourteen (when getting injections every fourteen days) can avoid the levels going too low. I feel that getting shots weekly is preferable, though. Unfortunately, the skin patches are not adequate for the job. I may begin with the cream or switch to testosterone cream (100 milligrams per gram in pluronic-lecithin-organogel (PLO gel) from a compounding pharmacy after a male patient has been on the shots for eight weeks so he can tell what the optimum effect is. Most men need 25 to 50 milligrams rubbed onto thin-skinned areas (for example, the inner upper arms from the elbow to two inches below the armpit) one to two times a day. The problem (for men) with taking tablets, instead of the shots or cream, is that oral testosterone goes to the liver first. The higher dose required by men (as opposed to women) can raise cholesterol levels. I'm beginning to suspect that avoiding other possible side effects by using the hormone cream twice daily (instead of getting high and low levels by taking the shot every week or two) is better. The cost can be markedly decreased by ordering the cream as 100 milligrams of testosterone per gram of cream. A new testosterone gel (Androgel, available in 25- and 50-milligram packets) may also work. Although much more expensive--approximately five dollars a packet--it may be cheaper if the patient's insurance covers prescriptions. A single daily dose of 50 mg of Androgel rubbed onto the arms or abdomen maintains blood levels for over 24 hours. For women, testosterone treatment is easier. Oral natural micronized testosterone (and natural estrogen and progesterone) are available through most compounding pharmacies. If the patient also needs estrogen or progesterone, they can be combined in the same capsule, at a lower cost. I usually begin by prescribing 2 milligrams orally or as a topical cream one to two times a day for six weeks to see the effect, then raise or lower the dosage if needed. With this dosing, most women feel more energy and have thicker hair, younger skin, and improved libido. I check free testosterone blood levels six to eight weeks after starting therapy (in men, just before their eight-week shot) and adjust the dosing accordingly. Blood levels are not reliable, however, if the patient is taking synthetic methyl testosterone instead of natural testosterone. Check the test one and a half to three hours after taking the tablets or applying the cream, or one day before an injection. In women, if acne, intense dreams, or darkening of facial hair occurs, the dose is too high and should be decreased. These effects, which can also occur with DHEA supplementation, are usually reversible. These side effects can also be caused by an estrogen level that is too low relative to the patient's testosterone, and may be avoided by supplementing both together. For women, it may be best to use estrogen for four to eight weeks before starting testosterone. This often decreases side effects. In men, acne suggests the dose is too high. It is important to monitor levels because (as in body builders who abuse testosterone by taking many times the recommended dose) elevated levels can cause elevated blood counts, liver inflammation, a decreased sperm count with resulting infertility (also usually reversible), and elevated cholesterols with increased risk of heart disease. Because of this, in men, a complete blood count (CBC), cholesterol test, and liver enzymes test should be considered from time to time. Testosterone supplementation can also cause elevated thyroid hormone levels in those taking thyroid supplements. If the patient is on thyroid supplements, I would recheck thyroid hormone levels after six to twelve weeks or sooner if they get a racing heart or anxious/hyper feelings. In addition, some men may get prostate enlargement or hair loss. Adding saw palmetto 160 mg twice a day--to decrease conversion of testosterone to DHT, can decrease this problem. If a man gets breast enlargement because of increased conversion of testosterone to estrogen, adding an aromatase inhibitor to prevent this conversion can also be helpful. These include DIM 100 mg a day, Chrysin 300 mg a day, and/or the prescription Arimidex 1 mg/day. Interestingly, in men, most studies show that bringing a low testosterone up to mid normal levels decreases angina and leg artery blockages, improves cholesterol, and may decrease diabetic tendencies! It is not clear if taking testosterone increases the risk of prostate enlargement or cancer beyond that of any other healthy male. While I don't think being testosterone-deficient is a good way to prevent these illnesses, it is reasonable to consider a prostate exam and prostate-specific antigen (PSA) test yearly. For many men, improvements in stamina, energy, and overall sense of wellness have been dramatic, and treating the low testosterone has been critical. Below are the treatment recommendations from the checklist that I give patients. Testosterone (Rx)--Males 100mg (1/2cc) shot every 7 days or 25 to 50mg (order 100mg/gm of cream) 2 to 3 times a day (less if acne occurs). Rub the cream into an area of thin skin on the abdomen, inner thigh or inner arms. Testosterone (Rx)--Females 2mg tablets or cream, 1 to 2 times a day--make 4mg/gm of cream (less if acne or darkening of facial hair occurs). Rub the cream into an area of thin skin on the abdomen, inner thigh or inner arms. For those of you who would prefer not to use estrogen or progesterone to treat the symptoms of menopause and perimenopause, excellent natural remedies are available. These will be discussed next month. Jacob Teitelbaum, MD is director of the Annapolis Research Center for Effective CFS/Fibromyalgia Therapies, which sees patients with CFS/FMS from all over the world (410-573-5389; www.EndFatigue.com) and author of the best selling book From Fatigued to Fantastic! His newest book Three Steps To Happiness! Healing Through Joy has just been released. He gives 2-day workshops on effective CFS/Fibromyalgia therapies for both prescribing and non-prescribing practitioners(see www.EndFatigue.com). He accepts no money from any company whose products he recommends and 100% of his royalty for products he makes is donated to charity.